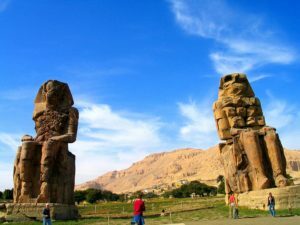 The famous Colossi of Memnon are all that remains of the burial temple of Amon-Ofis III and whose magnificences is recorded in stele found by the archaeologist Petrie. these statues, which must have stood to the sides of the entrance to the temple, are 2 meters in length and 1 meter in width. Cut in monolithic blocks of sandstone and portraying the Pharaoh seated on his throne, with his hands resting on his knees, the south colossus is in better shape that the other, to which a legend is connected. It would appear that in 27 B.C. a terrible earthquake severely damaged almost all monuments in Thebes and that an enormous crack opened up from the top to the middle of the colossus which it toppled Others, however, attribute this fact to the barbarities of King Cambise and this seems more likely as Egypt has never been prone to seismic movements. At the time every morning at daybreak the statue gave out a prolonged sound in which some believed to hear a sad, yet harmonious song. Greek poets soon created a beautiful legend around this strange fact testified by great historians such as Strabo, Pausanias, Tacitus, and Philostratus. According to them, the ” stone that sings” represent Memnon, the mythical son of Aurora and Tithonus, the king of Egypt and Ethiopia. Sent by his father to help Troy besieged by the Greek army, Memnon achieved great glory by slaying Antilochus, son of Nestor, but in turn, he fell under the revengeful hand of Achilles. Aurora in tears then beseeched Jupiter to resuscitate her son at least once a day; in this way, every morning, while Aroura was caressing her son with her ray, he replied to his mother disconsolately by wailing. In actual fact, the sounds were due to the vibrations produced on the surface which had been broken by the brusque passage of the cold of the night to the heat of the first rays of the sun.